In March, Capital's Lillie Lainoff won Washington City Paper's essay contest. Her essay about DC, lack of voting representation, and Congress, was one of four essays chosen to be published as part of a cover story about native Washingtonians. 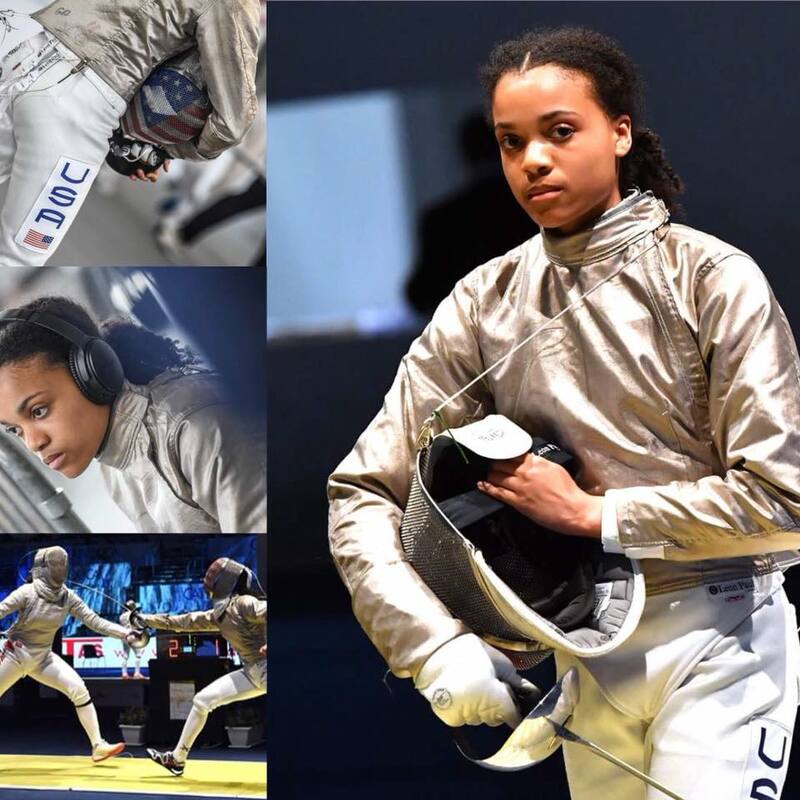 Congratulations to Honor Johnson for her bronze medal finish at the Cadet World Championships in Torun, Poland. The only returning member of the 2018 squad, Honor went 6-0 in pools and finished with her best international result to date. Congrats again to Honor, and to Coach Dariusz. Let’s go Capital!! One of my favorite fencing memories is captured in a video: I’m not fencing, but I am wearing my Yale warm-ups, bouncing up and down to keep my muscles warm. A crackling voice announces names over an intercom, and when they reach “Lainoff, Yale” I turn to the camera – I turn to my mother – and I smile so wide my face looks like it might split in half. I was never supposed to make it to NCAA Championships. I was never supposed to be a competitive athlete… I was never supposed to be an athlete, full stop. And yet, there I was, competing at the highest level of collegiate athletics for Yale University. Before I started fencing at age 9, I’d tried out almost every sport imaginable. My parents thought a sport would give me an opportunity to spend more time with friends, but also hoped that it would improve my coordination. I was spectacularly clumsy and couldn’t run a mile without being winded. I hated swimming and soccer and ice skating and softball and my parents had just about given up when I begged them to let me try fencing after I saw a demonstration at summer camp. A few months later, I started classes. To say I wasn’t a natural fencer would be an understatement. But the individual nature of the sport worked for me – and it didn’t require me to catch or throw a ball. I kept pushing and training, and the following year I fenced in my first competition: a Super Youth Circuit in the under-10 age division, where I, to the surprise of everyone – especially myself – finished second. By the time I was 12, I was ranked 10th in my age category nationally. Things didn’t change at one exact moment. It was just a bit of dizziness at first. But then came the blurry vision, the ringing in my ears, my legs refusal to hold up my own body, my brain’s inability to remember what I was saying mid-sentence. Fencing practices were replaced with doctor’s appointments, traveling to national competitions became traveling to the Mayo Clinic. There, I was diagnosed with POTS, an autonomic nervous system disorder characterized by drastic drops in blood pressure, shortly followed by a wild heart rate – the body’s attempt to force blood up and out of its extremities. I was lucky to get a diagnosis. I was lucky that years of competitive fencing had toned my legs so that, although my symptoms were awful and my heart rate painfully fast, my blood vessels had an easier time constricting to keep my blood pressure in a range where I wouldn’t faint (at least, not too often). But I didn’t feel lucky having to take so much medicine. I didn’t feel lucky when it took me hours to complete homework that my classmates finished in less than half the time. And I definitely didn’t feel lucky sitting on the sidelines at practice, checking my heart rate while I watched my teammates fence. Through all this, I wasn’t alone. I had my teammates to encourage and cheer me on. I had my coach, Dariusz Gilman, who could have decided that a sick girl wasn’t worth his time and focused on other students. Instead, he had me take lessons on his rolling office chair. I used my feet to move myself up and down the fencing strip as we worked on ‘green fencing,’ a style he developed for me with an intent of conserving energy. By 10th grade, I slowly started to return to competitions. Coach Dariusz never gave up on coaching me at national events, even when I lost bout after bout. When it came time for college recruiting, some schools were interested in me, some weren’t. My results were good, not great – but they demonstrated my resilience and commitment to improving my fencing long-term… and my grades showed that I was ready for a challenging academic environment. Being recruited by Yale was a dream come true. Every time I step on a fencing strip, I feel like I’m fencing two bouts: one against my opponent, and another against POTS. Fencing taught me persistence, to never give up even when everything seemed stacked against me. Fencing gave me perspective: getting stuck with yet another needle for yet another blood test wasn’t so bad – I just pretended they were sabers. Fencing taught me time management: during my junior year of college while fencing for Yale, working as team manager, managing the Yale Daily News Magazine and tutoring at the Yale Writing Center, I wrote a novel. And fencing helped make me brave. Brave enough to know that even though I will fall, I would somehow find a way to get up again. To me, fencing isn’t just about the competitive results or how it bolstered me in my fight against POTS. I love this sport. Fourteen years later, I’m still fencing and coaching, and I’ll never, ever give it up. I remember my parents’ car trudging through the streets of Rochester, the mountains of snow lining the road, the swift turn onto Main Street, and the red-brick armory towering into view as my heart began to pound louder and louder. Flower City Super Youth Circuit, late November, 2008. This was my first fencing competition. That day is now a jumble of memories. Some bouts were won, some lost, and drama was experienced from pools to DE’s. The day finished off with a 3rd place medal and a celebratory dinner before the sleepy drive home. I will never forget the feeling of that first competition: the strangest mix of both exhilaration and terror. I was hooked. Yet, I never could have predicted that this day would start my journey towards the halls of Harvard University. I first learned about fencing through my father. He had fenced as a teenager and young adult in Poland. Ever since I can remember, he instilled in me the value and importance of sport. I grew up playing lots of tennis, but the first time I tried fencing, I knew this was the sport for me. I was eight years old. From the very beginning, I trained under Coach Dariusz Gilman. As I grew, his program expanded too. I got taller, practices got longer, and the exercises got harder. Around the time I was ten, I began competing in regional and national tournaments. Fencing followed me throughout middle school, when I started to understand what the words hard work, discipline, and commitment really meant. Flash-forward to high school: after growing up under Coach Dariusz’s program for so many years, I got to help set up the floor tiles of Capital Fencing Academy and celebrate its grand opening. From thereon out, everyday after school, I would come straight to the club. Training hard and competing had pushed me higher up the rankings, giving me the opportunity to start competing internationally in World Cups. Representing Team USA, I traveled to Austria, France, Germany, Hungary, Italy, Poland, and Costa Rica. At the same time, with all the school I was missing, I had to learn how to hustle to complete all my homework. I could often be found sprawled across the floor of an international airport writing an essay or hunched over my tray table in an airplane attempting to understand Calculus. Focusing on fencing helped me get focused inside the classroom, earning me a recruiting slot on the Harvard Fencing Team. None of this was easy, but looking back, I can say without a doubt that all that hard work has paid off. I was lucky to have found this complex and intriguing sport. The beauty of fencing is that, unlike many other sports, it fits any body type, like pingpong. Fencing not only molded me into an athlete, but also taught me how to manage my thoughts and emotions during nerve-racking moments of competition. I was also lucky to have had the full commitment of my parents in the pursuit of fencing. Throughout the years, they supported me both financially and emotionally. Without them, it would have been impossible for my fencing dreams to become reality. I can’t say it any simpler: Fencing changed my life. I will forever be grateful for this sport, for all my coaches, and for the amazing fencing community I’ve been a part of. The lessons I’ve learned from fencing have continued to follow me off the strip and become a guiding philosophy for my life. At practice, it was always about more than fencing. It was about living up to one’s potential and becoming better each and everyday. 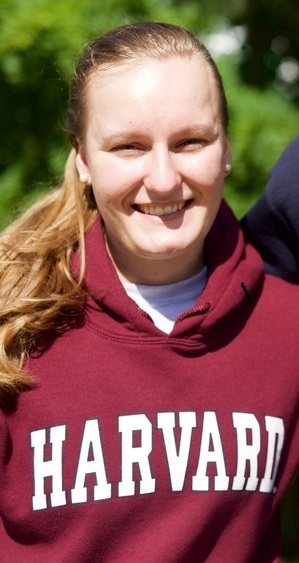 Today, I am proud to be a Capital alum, Harvard student, and Harvard Fencing Team member. My story shows that dedication to both academics and athletics can open doors of opportunity and achievement. Congratulations to our very own Honor Johnson on her 11th place finish at her first Cadet World Championships! Here’s what Honor has to say about her experience: “I loved Italy, especially Venice and Verona! I gained more knowledge and more experience competing at such a high level with world champions. I was happy to be healthy and to fence strongly. The Cattolica Center is interesting and probably the coolest venue I have ever fenced in. The USFA cadre that traveled with us was absolutely amazing and I was super grateful they were there to support and cheer on the team - from Jennifer Yamin to Daria Schneider to Brandon Dyett to Matt Porter to Jennifer Krug -- the list is long. I hope I'm fortunate enough to have this opportunity to fence at worlds again. It was definitely the highlight of fencing for me thus far.“ Again, congrats to Honor and the US Team! Way to represent! Capital fencers off to a great start! Team USA take the Men's Sabre Silver at the Veteran Worlds! 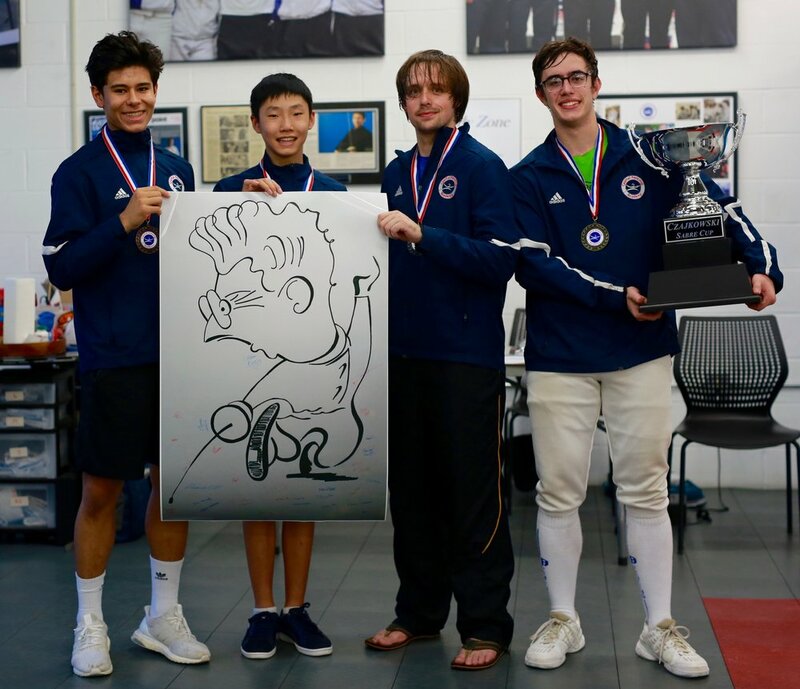 Competing against 11 other international teams today, the USA men’s sabre team took the Silver! Congratulations to all the USA team members: Carl Badger, Victor Bianchini, Dmitri Koplov, Phil Sbarbaro, David Seuss and Ron Thornton! Ron Thornton medals at the Vet Worlds! 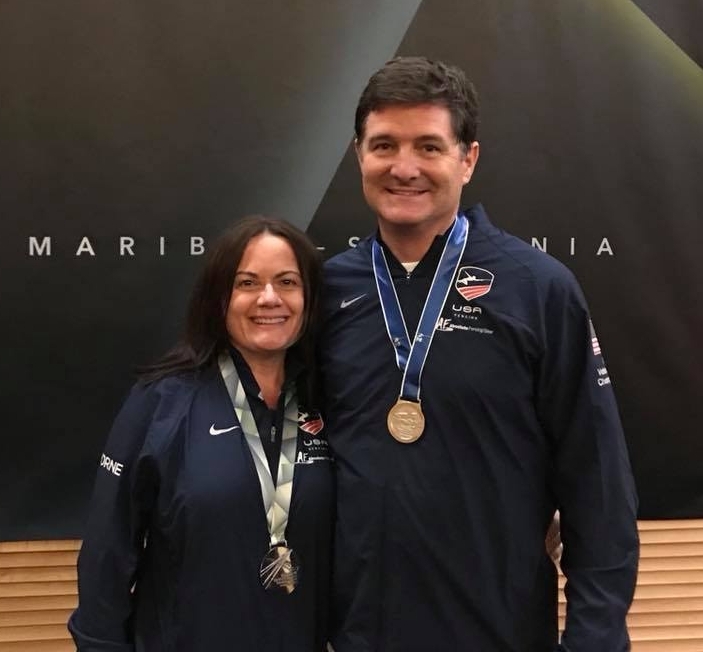 Capital fencer, Ron Thornton, represented Team USA at the 2017 Fencing Veteran World Championships Men’s Sabre 50-59 event this past week in Maribor, Slovenia. Ron finished 3-3 in the first round of pools, being seeded 30th place out of 67 fencers from all over the world. Pulling off an incredible upset against the 3rd seeded fencer from France, Ron had to beat another American to finish 8th !